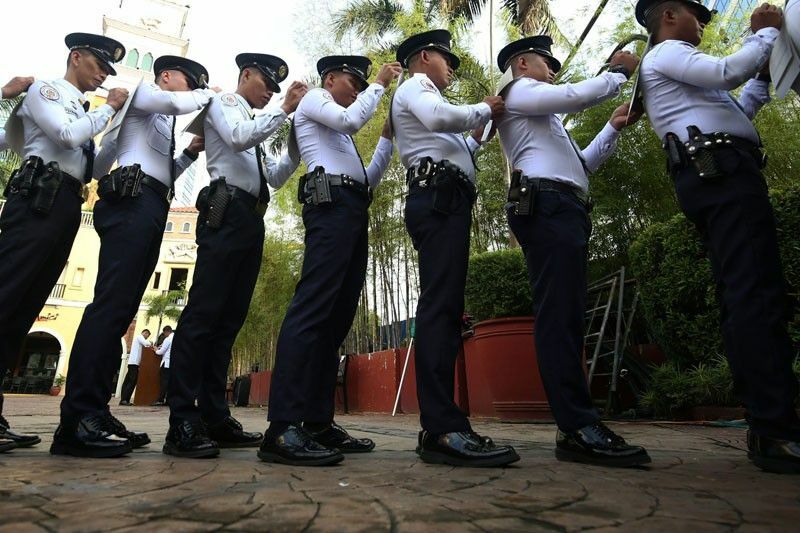 MANILA, Philippines – The Philippine National Police (PNP) fined 15 mall security guards Php10,000 each after they were found wearing Christmas costumes while on duty. The move has gained flak from netizens who called the cops as spoilsports, saying that this is Christmas season and everyone can wear costumes if they wanted. Philippine National Police Supervisory Office for Security and Investigation (PNP-SOSIA) Enforcement Management Division officer-in-charge Superintendent Jaime Santos said that they conducted security checks after receiving complaints from the public that some guards at a mall in Quezon City were wearing costumes similar to Vatican Swiss Guards. Upon inspection at the said mall, the cops discovered that not only were the guards wearing costumes, the mall’s security agency also had a number of violations. “Umabot ng halos more than P400,000. Ang daming violations committed, expired DDO, walang license to exercise security profession, tsaka yung tinatawag na unprescribed uniform. Mataas kase ang penalty noon,” Santos revealed. It turned out the mall isn’t the only one with security guards in costume. 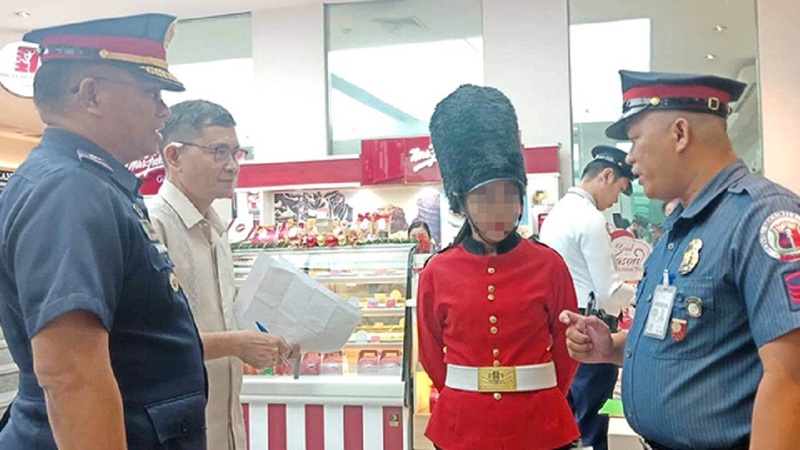 After the PNP conducted more inspections in malls around Metro Manila, they caught fifteen security guards at the Landmark Department Store in Makati City wearing costumes similar to that of British Royal Guards. The guards have been fined Php10,000 each for the violation that would have to be paid by the security agency. According to Santos, they are strictly implementing the law that requires security personnel to only wear prescribed uniforms. 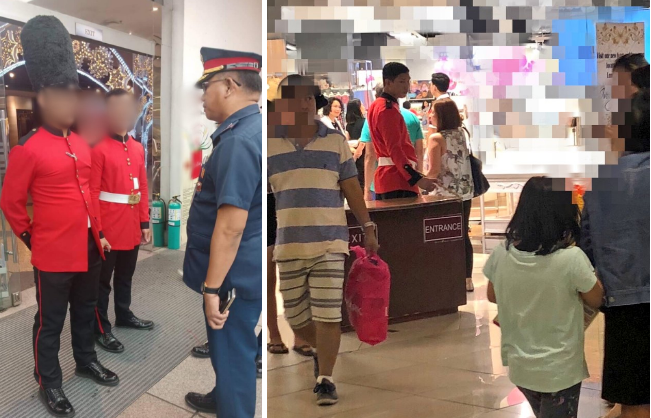 He also emphasized that security guards, even those assigned at the mall, should not be deployed for entertainment but should focus on making sure the mallgoers are safe. Not wearing the prescribed uniform also poses security threats, especially because the guards lose access to their firearms while wearing the costumes. Santos also added that groups might copy the costume easily. “Unang-una, mataas yung security risks niya na maaaring gamitin or gayahin ng mga grupo na gustong gumawa ng krimen sa loob,” Santos said. He added that the public might not know who to turn to when there are emergencies because the guards are wearing costumes. “Kapag may mga emergencies na kinakailangan ang presensiya at tulong nila hindi sila lalapitan dahil ang alam nila, ordinaryong employee,” he explained.